Credit: Gift of Mrs. Thomas O. (Mary Rich) Richardson. Elihu Vedder (1836-1923) was an American painter, illustrator, sculptor, and writer. He studied under Tompkins Harrison Matteson in Shelbourne, NY, before settling in Paris in March 1856. He later moved to Florence in 1860. Vedder was inspired by Italian artists of the Florentine Renaissance, who sought new and untraditional pictorial solutions for their compositions and plein-air landscapes. This group of artists became known as Macchiaioli for their use of splashes (macchia) of light and shadows and for their revolutionary (maquis) attitude to prevailing styles. After returning to New York in the 1860s, Vedder began selling his landscape and genre paintings to patrons in New England. The Motherless (1864) represents his early thematic concentration on rural American genre scenes. It also shows his growing interest in introspective, melancholic, and evocative subjects. 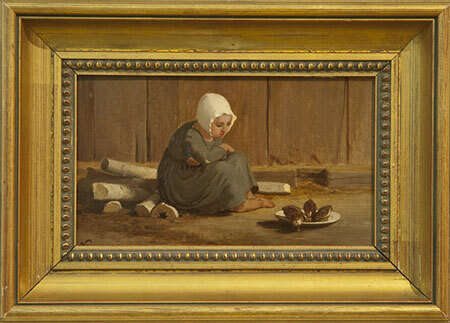 In the work, a young girl huddles on a pile of birch logs, staring at a white dish holding three chicks. The intricate rendering of each detail and careful attention to light are indicative of Vedder’s interest in Dutch painting. In 1979, the college had the rare opportunity, which it declined, to purchase crayon drawings studies of The Motherless from Kennedy Galleries in New York City. The painting was one of several dozen 19th century works donated to the college by Mrs. Thomas O. (Mary Rich) Richardson. Richardson never attended Wheaton, nor does it appear that she ever visited campus, but she was close to Trustee Emerita Francis Vose Emerson, Class of 1872. 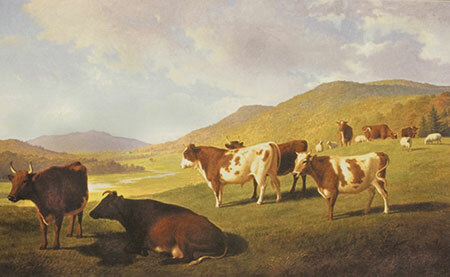 Among the other works she donated is Pasture with Cows, as seen below.